Sweet Treats | Just Shooting Memories! My computer caught a cold over the weekend and I had to give it the old cold remedy. It only took about 30 hours to re-install and then get all the updates. Now I am just waiting for the opportune time to make an image of the drive because I am not going through that again. My family and I have developed quite the appetite for ice cream over the last couple of months. Maybe it has something to do with the horrible heat this summer. We found this nice little ice cream shop on the square in Marietta, Georgia. This photo was a small victory for me. I have always been a kinda shy guy growing up and I still find it hard to go into a place and ask if I can take a few shots. 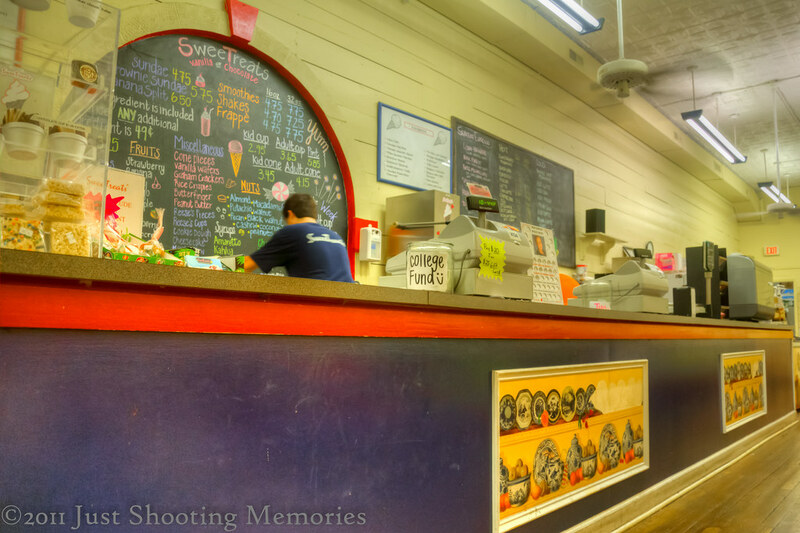 I was proud of myself for working up the nerve to ask to take a few shots in the Sweet Treats gallery. There were so many colors in this place. I was like a kid in a candy factory or maybe just an ice cream store. If you ever get to make it by Sweet Treats, check out the way they make the ice cream. There is nothing like a giant drill bit to soften ice cream. I’m a bit on the shy side too, but I’m developing a stealth technique where I sneak around and shoot, then if I get caught I ask. I find most smaller stores are suspicious at first, then flattered you want to shoot their business. The big ones have too many policies against photography and won’t allow it. Tim, I tried the sneaking thing, but a big SLR kinda sticks out and I can’t stand a point and shoot. I know what you mean about big businesses. I went by a Starbucks a few weeks ago and I was told it is company policy for them to not allow photographs of the interior of the building. However, I was told that if it was just like snap shots of friends while we were hanging out that was okay. I wonder if it would be okay to take snapshots with the tripod?